Want To Be An Executive Coach? Read These Books. As recently as 2015 the thought of doing executive coaching had never crossed my mind. I had my marketing agency, MWI, I was writing for Forbes and several other publications, and my plate was full. Then someone offered me $1,000 per month, just to give her advice. I wasn’t prepared for that offer. I didn’t know what coaching looked like or how it worked. I also didn’t realize the value of my advice, and felt hesitant to charge what seemed like so much for what I felt was so little effort on my part. I turned that potential client down, but began researching the executive coaching, which included getting my own coach, and reading lots of books. Now I charge quite a bit more than $1,000 per month to give advice, and I’m confident of the value I’m delivering. Here are some of the books that have been the most helpful to me on my executive coaching journey. This is the business side of being a coach, more than the client-facing art of being a coach. If you’re looking at executive coaching as a potential way to make a living, read this book first to see if it’s really for you. If it gives you pause, perhaps coaching isn’t for you. If it gets you excited, then keep reading more coaching books. One of my favorite takeaways from this book is the story Whitmore tells about having ski coaches coach tennis players, and that the ski coaches did a better job coaching tennis players than the tennis coaches did. Why? Because the tennis coaches were too likely to not coach, but simply tell the players exactly what to do. Sometimes your executive coaching clients need to be told what to do. If someone who is just starting out building a personal brand and has just launched their website asks me “Should I use MailChimp, ConvertKit, or Infusionsoft?” I’m going to say “ConvertKit, hands down,” rather than “What do you think?” But mostly coaching is listening and asking questions, drawing out answers from the client and helping the client find his or her own way. The goal is not to tell a client everything he or she should do, but to help the client get to the point where he or she is self coaching. Coaching isn’t just for coaches, or rather, people who have the title “coach” aren’t the only ones coaching. We’re all in positions to coach, but we’re not all trained how to coach. And there’s a gap between being trained, and making effective coaching a habit. Once it becomes a habit, simply the way you are, then coaching becomes highly effective. The Kickstart Question – “What’s on your mind?” This allows clients to jump right in to what they really care about and take care of burning questions that might distract them from anything else you say if they’re not resolved at the beginning of a session. The AWE Question – “And what else? We all need prodding from time to time to give the real answer. This can be the most valuable question a coach ever asks because it can get us to the heart of the matter at hand. The Lazy Question – “How can I help?” Sometimes people send me emails or chat messages and after reading it five times…I’m not sure what they want me to do. They seem to be asking a question, but I can’t figure out what it is. So I get direct and ask. This forces the client to get clear and direct about what he or she wants from me as their coach. If you’re investing in yourself as an executive coach this is a great book, but it’s also a great book for all leaders. This is a FAST read. It’s very short, but very refined and full of wisdom. It’s the best ROI on your reading time, no doubt about it. I read it four times in two days after picking it up for the first time, and I plan to read it several more times. It also includes the 17 lies to avoid as an executive coach. If your clients don’t trust you, they won’t listen to you, and your coaching will fall flat. That’s part of the message in The Trusted Advisor, but more than that, the authors explain how using their “Trust Equation” and its five steps, you can create a trust-based relationship. Each step (engage, listen, frame, envision, and commit) is detailed in separate chapters. Lots of actionable tips on how to be an effective executive coach or leader of any type. Full disclosure: I haven’t read this yet, but it’s on my to-read list, others have recommended it to me, and I’ve known Michael for almost 20 years and he knows his stuff, so I’m sure it’s going to be great. Once I read it I’ll come back and replace this. Schein’s main point is that we often “coach” by telling people what we think they need to know. Nobody likes to be on the receiving end of that. People shut down when told what to do. They end up not listening. The better way is to ask questions. Not manipulative questions designed to get people to do what we want them to do, but sincere, humble questions that assume that perhaps our clients know something we don’t, and that we can only help them by understanding them. Do you notice a trend here? A lot of these books and my comments on them center around asking questions and listening. Effective executive coaching is at least 90% listening. It’s the coach who’s lacking in confidence who talks, talks, talks. Listening can turn enemies into friends, make proud people humble, and persuade those who throw up barriers. What if you were given the ultimatum: make a radical shift in your life, or lose it all? Deutschman says that we all need to change, but few of us ever do in any substantive way. Smokers keep smoking, diabetics keep drinking soda, and many companies keep doing the things that are dragging them down. As a coach, you’re not adding value unless you’re driving change, and this book will help you understand why you need to challenge your clients to change, and how to help them make changes that stick. I loooove reading. 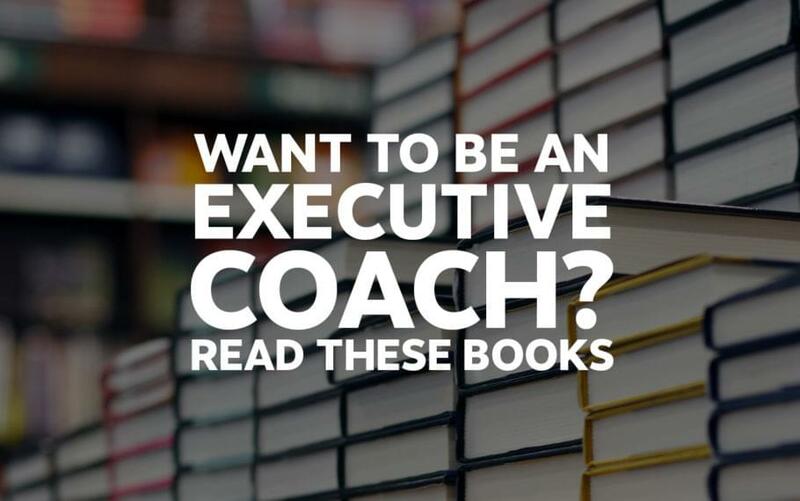 If you’ve got any books you think will help me (or others reading this post) to become a better executive coach, tell me about them in the comments below.